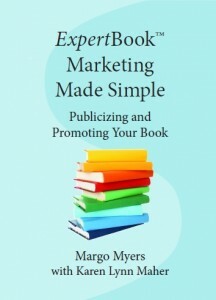 Monday, June 24th, 2013 is the ‘official’ launch day for my new book, ExpertBook Marketing Made Simple, Publicizing and Promoting Your Book, written with Karen Lynn Maher! If you are considering writing a book, or have already started the process, this practical, easy to read guide will help you answer questions about your book and your audience, and get the process started for thinking about your post-publishing marketing campaign! And if you have any questions, please don’t hesitate to contact me! You can find the book on my website, on Amazon, and there is a Kindle version available as well.